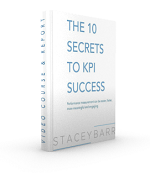 When you choose KPIs too quickly, they will often be too trivial or superficial. You need deeper thinking to understand your real results, first. Roy is a PuMP user and fan. He stays in touch with me, sharing updates of his progress with improving performance measurement in his organisation with PuMP. I love that! “80% of customer interaction is online”. Roy had easily facilitated his leader to articulate the real results. The original KPI of “80% of customer interaction is online” was not the real result. It would have inspired everyone to focus on shifting and shunting customers to interact only online, to hit the target. You can imagine the unintended consequences of that, can’t you? So Roy now had a leader who was interested in measuring the real results. And therefore was curious about how Roy could help to do this. He gained agreement with the leader to test out PuMP. What can Roy teach us about helping leaders who choose KPIs too quickly? With a few easy steps, you can influence your leaders to choose better KPIs. Know how to recognise a poor KPI. When you’ve recognised a poor KPI, be brave to ask leaders what result they really want, and possibly point out the disconnect between that result and the already-chosen KPI. Have a method to offer leaders, for making the result measurable, and designing the best KPI to measure it. The hardest part of this process is deciding to try it. Be brave, because it will work. Choosing KPIs too quickly drives you in the wrong direction. Clarify the result first, then the measure. Do have trivial KPIs drive your leaders in the wrong direction? How were those KPIs chosen; were they chosen on-purpose, or because they seemed obvious at the time? Thanks, Stacey! One great article headline. I’ll really enjoy reading that tomorrow. Glad you like this one, Samson. I hope it helps. And I hope you stay subscribed just a bit longer! Greatarticle especially as I head into a new department. I’d be curious to see what Roy came up with as far as meaningful KPIs.